If you’ve ever attended a conference or workshop with any kind of a design focus—instructional, graphic, web design, etc.—you may have encountered the term “design thinking.” Sounds serious and important, doesn’t it? And in a field where so many of us have no formal design background, the idea of adding “design thinking” to your already full plate of responsibilities may sound like a nonstarter. 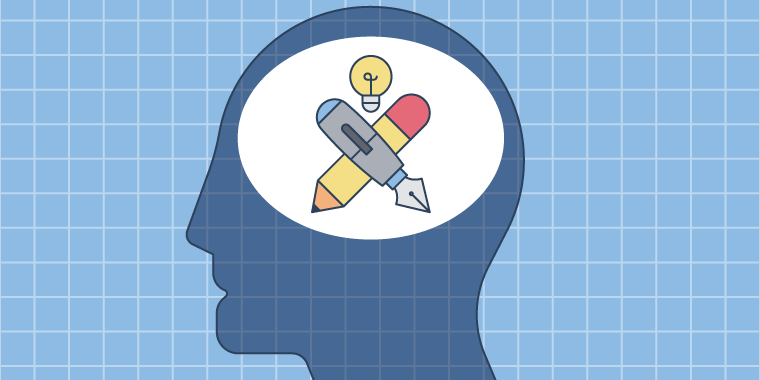 But before you write off design thinking as yet another impossible task or dismiss it as a trendy buzzword, let’s give it a closer look to uncover what it is, why it matters for training, and how it works. In a nutshell, design thinking is a process for creative problem-solving. Using techniques like brainstorming, along with other collaborative activities, a project team puts themselves into the end user’s shoes—to experience problems from their perspective. By getting everyone to set aside their preconceived ideas and truly empathize with users, the design-thinking process paves the way for identifying creative solutions that actually address a user’s problems in a meaningful way. What resonated with me is the idea that we all have the capacity to be design thinkers! In other words, you don’t need to be a degreed designer or a creative genius to embrace design thinking practices. If you care about solving a problem by using empathy and evidence to inform your decisions, and can embrace a spirit of collaboration and experimentation, you’ve got what it takes to be a design thinker! Why does design thinking matter for training? As we’ve just learned, design thinking is about applying a user-centric approach to the work of solving problems—which is also what course designers do when they create training. Think about it: most instructional designers spend their days analyzing the root of performance problems so they can focus on ways to creatively transform content in a way that leads to improved performance. So, as I see it, instructional design done well is a design-thinking process. As with any process, design thinking is broken down into phases. Here’s a quick overview of each of the seven phases placed in the context of a typical e-learning instructional design project. Define. You can’t tackle the problem until you give it a name, and in this phase the goal is to do just that—to articulate the problem you’re trying to solve. Research. Once you’ve defined the problem, you need to have a really good understanding of it. This involves doing your research rather than relying on your assumptions about the problem or your gut instincts. To have true understanding, you need to uncover the root of the problem and that may mean digging in, firsthand, out in the field, working in the user’s environment. In instructional design terms, this phase is at the heart of the “A” (Analysis) in ADDIE. And just like any research, it takes time to gather and analyze all of that data. Problems, particularly performance problems, often have complex, intertwined roots in things like company culture, hiring practices, onboarding, equipment quality, operating conditions, work environment—the list goes on and on. You may not uncover them all in a few hours or even in a few weeks. The big takeaway: It pays not to skimp on this phase; otherwise you may end up devising a solution that’s creative but not effective. Ideate. You’ve defined the problem and you’ve done your research. Now what? If the research points to there being a learning-based component to the problem, it’s time to start coming up with ideas. This is the fun, brainstorming/creative part of your design work. This phase may also involve pulling in folks from other teams to help you spitball ideas and maintain a user focus. At the end of this phase, you should end up with one or two solutions you can move into prototype. Prototype. Once you’ve got a few ideas to focus on, it’s time to try them out—preferably on real users. For e-learning, prototyping can take the form of a simple sketch, an outline, a storyboard, or a functional alpha built with a tool like Articulate Storyline. Whatever prototyping approach you choose, the point is to see how your ideas hold up to reality. You want things to break or be wrong at this phase so you can learn from your mistakes and then adapt or iterate on your ideas to hopefully improve upon them in a future prototype. Choose. After you’ve prototyped and learned more about the strengths and weaknesses of your solution, it’s time to choose the best of your designs to implement. In other words, this is where stuff gets real! Implement. Once you’ve designed your learning solution and developed it, it’s time to roll that baby out to the masses. For training, this may take the form of instructor-led workshops, webinars, an internal marketing campaign, an e-learning course on your LMS or website—or all of the above. Learn. Just like the “E” (Evaluate) in ADDIE, this phase is all about evaluating outcomes—how well your solution addressed the user’s problem—and learning from those outcomes to inform your approach to future projects. For e-learning, this may involve activities like holding focus groups to gather learner feedback and evaluating key performance indicators to see if your solution had the desired business impact. It’s important to clarify that design thinking isn’t a linear process. It can get messy and repetitive as you iterate and refine ideas. The process encourages experimentation and the exploration of ambiguity as a means of personal growth and innovation, but that doesn’t mean everyone will be comfortable with it. While you may find that some areas of design thinking come more easily to you than others, the important thing is to embrace the growth mindset at the core of the process. I just gave you the 10,000-foot view of design thinking, but there’s so much more to learn. If you’re looking for ways to unlock your design-thinking potential, check out these resources. What’s your take on design thinking? Jump into the conversation and share your ideas with us. And be sure to follow us on Twitter, where we post the latest and greatest e-learning news! As a followup to this article I strongly recommend the book: This Is Service Design Thinking. http://thisisservicedesignthinking.com/ and one of the freebies that they share on a website that is called Customer Journey http://files.thisisservicedesignthinking.com/tisdt_cujoca.pdf you can easliy apply this to learning i.e. accessing the course on the LMS. Hi Richard. I would agree that is very similar. But Design Thinking I think differentiates itself in the evaluation stage in the ASQ model. ASQ then moves to a pilot of a chosen alternative. Design Thinking prototypes very rapidly and messy, in order to evaluate. I would say Design Thinking is a closer analogy to, or incorporated in, the SAM process that Michael Allen and Allen Interactions uses. Check out "Leave ADDIE for SAM." I attended a "Leaving ADDIE for SAM" workshop a couple of years ago and it follows are very similar process. No storyboards!